This week’s featured post is “Undecided With 8 Days To Go“. The Iowa Caucuses start this evening. Most recent polls show a close race with a small advantage to Clinton. But Iowa has such a weird process that polling often gets it wrong. On the Republican side, polls show that Cruz peaked about three weeks ago, and that Trump has regained a medium-sized lead, even though his numbers have been falling too for the last week. But since he never developed a ground game, nobody can say how many Trump supporters will get to the caucuses and stay long enough to make their votes count. Cruz is still running second, but fading. Rubio is third and rising, so it’s not impossible that he could finish second, or even first if Trump’s voters don’t show up. Tomorrow, I expect the media to be saying that Rubio’s showing was the most surprising, and that he has momentum going into New Hampshire. But I don’t think I’ll be buying that interpretation if he doesn’t actually win. I think Obama/Clinton in 2008 showed that there is no “momentum”. Only votes and delegates are real. Friday morning I tried to see Donald Trump in Nashua, but it turns out that having a ticket and being 45 minutes early wasn’t good enough; I was third in line when they announced that the room had reached its fire-safety capacity. Hundreds of people were still in line behind me, so I’m not sure what the point of having a ticket was. But most of what I wanted to do was observe the crowd, so I got to do a little of that while standing in line. Everybody I saw was white, which isn’t that big a surprise in New Hampshire. Men outnumbered women, maybe three to one. Nobody was wearing or saying anything overtly racist or anti-Muslim. People didn’t bring signs and I didn’t see any protesters. We didn’t chant slogans or get rowdy. For a group of supposedly angry voters, we were all surprisingly docile as we waited in the sort-of-cold until we were told to go home. The guys in front of me hadn’t definitely committed to Trump yet, but they thought Cruz had looked bad in the previous night’s debate, the one Trump boycotted. They agreed that Hillary Clinton has “no chance” and speculated about whether she’d be indicted for the email thing. They were sure she deserved to be indicted, but disagreed about whether Obama would allow it. My general sense is that it wasn’t that Cruz got attacked or that the attacks on him did any particular damage. It was that the spotlight was inherently bad for him. … This whole portion of the debate – which lasted for maybe the first 45 minutes or so – had the feeling of walking into a conversation at a party that’s just very awkward and uncomfortable – because it’s Ted Cruz holding court and pontificating. And you want to leave. Again, it’s not that the attacks were particularly biting or damaging. It’s just that you saw Cruz up close. And he’s not pleasant to be around. I also don’t think Trump’s event competing with the debate did him any good. (I can’t imagine it playing well in Iowa when Trump called another rich New York developer up to the stage with his young trophy wife. I suspect Trump’s own marriage is not something middle-aged Iowa housewives want to dwell on too long.) So Trump and Cruz both looking bad recently is another reason Rubio could do better than expected. We now have Trump’s plan for replacing ObamaCare: “We’ll work something out” with the doctors and hospitals, he says. I don’t know why no one had thought of that before. A questioner told Ted Cruz about his brother-in-law, who didn’t have health insurance until ObamaCare, but started seeing a doctor too late and died of cancer. “What are you going to replace [ObamaCare] with?” he asked. there are millions who had health insurance, who liked their health insurance and who had it cancelled because of Obamacare … millions are losing their insurance now and if we allow people to purchase across state lines, it will drive down the cost where they can afford it and get it earlier. [Your brother-in-law] would have gotten [health insurance] earlier if he could have afforded it earlier, but because of government regulations he couldn’t. It’s worth pointing out that the regulation that raises costs the most is the government’s perverse insistence that health insurance actually cover you if you get sick. Policies that include ways for the insurance company to weasel out of covering sick people can be amazingly cheap. And if you never get sick, you never know. Exposé news stories have a stereotypical trajectory: There’s a problem that officials are sweeping under the rug, but journalists or whistleblowers uncover it. And then things get taken care of. The problem is fixed, victims get the help they need (better late than never), and the irresponsible officials are disgraced. Happy ending. That doesn’t seem to be happening in Flint. The first part — problem, rug, uncovering — follows the script. And while Governor Rick Snyder hasn’t been forced to resign (yet), some lower-level people have, and I think Snyder’s political career is pretty much over. But the problem is a long way from fixed. So now Flint is back to using Detroit’s water, and the long-term plan to have its own pipeline to Lake Huron is on track for completion in June. But that hasn’t solved the problem, because the lead didn’t come from the river, it came from the pipes. A lot of faucets in a lot of homes still have elevated lead — some many times higher than the recommended filters can handle — and nobody knows how long that will continue. The sure solution is to find all the lead pipes and replace them, but that could cost hundreds of millions of dollars, which nobody is volunteering to pay. But waiting for the lead levels to come down on their own — drinking, cooking, and bathing with bottled water in the meantime — gets old in a hurry. And then there are the long-term effects of lead exposure on children’s brains. Is the state going to take responsibility for that? How? Wednesday, Rachel Maddow devoted her whole show to a townhall meeting in Flint, talking to local residents and various experts on water and plumbing and lead poisoning. That series of videos starts here. Tuesday night, the authorities finally did something about the militia occupation of the Malheur Wildlife Refuge near Burns, Oregon. The leaders of the occupation were arrested on their way to a community meeting set up by supporters in the nearby town of John Day. Unofficial spokesman Lavoy Finicum was killed. Supporters have tried to make a martyr out of Finicum and claim that the government intentionally murdered him, but the FBI eventually released aerial video of the confrontation: Finicum’s truck stops for several minutes on the highway as police cars flash their lights behind it. Then the truck races forward until it gets to a police roadblock. At that point it tries to drive around the roadblock and gets stuck in the snow. Finicum gets out of the truck with his hands up (his passengers stay inside), but doesn’t appear to be surrendering as he sidles further off the road, away from police. When he reaches into his coat he gets shot. Police claim they found a handgun in his coat. Ammon Bundy and his brother Ryan are among the arrested. They have been charged with a felony that seems designed for this situation (actually it was designed for Confederates seizing federal outposts in the Civil War): conspiracy to impede officers of the United States from discharging their official duties through the use of force, intimidation, or threats. A handful of holdouts (maybe five) are still occupying the refuge. Like Bundy, they seem to grossly overestimate their negotiating position: They want to leave without charges, or maybe to be guaranteed a pardon. But the FBI is only interested in talking about how they’re going to surrender. The authorities seem to be tightening up a little more all the time; they’ve now cut off internet and cellphone access. Bundy, meanwhile, has asked the remaining occupiers to go home, possibly because the judge in Portland can’t see offering him bail while there’s an armed camp he could try to run to. This fight is ours for now in the courts. Please go home. Being in the system, we are going to take this opportunity to answer the questions on Art. 1, Section 8, Clause 17 of the United States Constitution regarding rights of statehood and the limits on federal property ownership. Once again, headlines indicate that something maybe-sorta might come of the Clinton emails. But Dianne Feinstein still doesn’t think so. The latest revelations that Secretary Clinton’s emails include classified information lack the same key information as previous reports. First, the 22 emails the State Department has labeled classified are part of seven separate back-and-forth email chains, and none of those emails chains originated with Secretary Clinton. So: Seven times during her Secretary of State years, somebody sent her an email containing information that wasn’t marked classified at the time, but in hindsight should have been. The U.S. government defines this as any information, written or spoken, provided in confidence to U.S. officials by their foreign counterparts. I wish we had a control on this experiment: If we looked at all the emails of some other State or Defense secretary chosen at random, how many similar examples would we find? 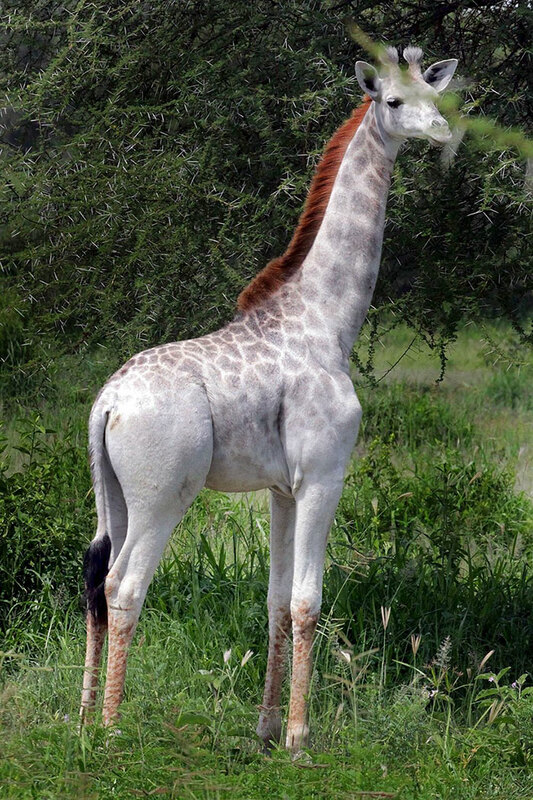 This white giraffe ought to be the center of a cult. It’s amazing how well the climactic speech of Charlie Chaplin’s “The Great Dictator” stands up after 75 years. I wish Sen. Feinstein’s comments regarding Sec’y Clinton’s “email problem” were getting wider dissemination in the media. I’m inclined to believe her. Sorry, but the media hasn’t been telling me… What did she say? 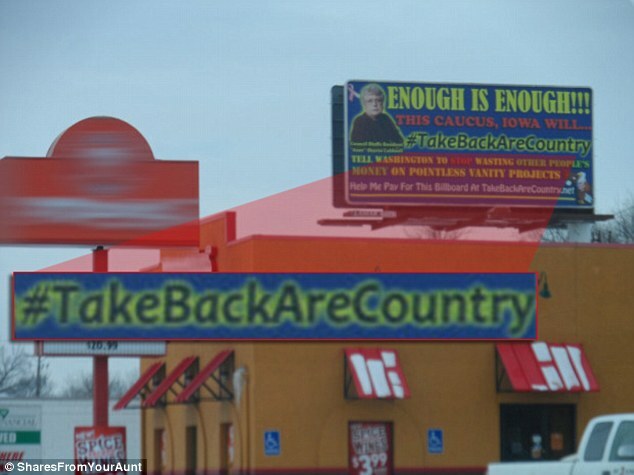 #TakeBackAreCountry is so truthy I almost recirculated it before realizing it was a joke. As an Oregonian I would like to point out that the people who took over the Malheur refuge were not Oregonians. So we have the spectacle of people from other states coming into Oregon with guns and wrecking havoc on a small town while arguing for local control while the locals are telling them to go home. So no case from Oregon cause the criminals are not from Oregon and thus have no standing. All this is costing, the locals huge amounts of money and tearing apart the community. I’ve brought this up in discussions with people who support the Bundys’ insurrection, and the response is that the State of Oregon is not a “territory” of the federal government, therefore, Congress has no authority to set limits on the use of public land. I’m not a constitutional scholar – can anyone help me out here? I don’t know much about constitutional law &/or how the Constitution would be interpreted in a case like that. However, I do know that many of the western states have clauses in their state constitutions specifically ceding control of lands unclaimed at the time of the signing within their borders to the federal government, although I don’t know exactly how they operate. I’m also pretty sure that land owned, regulated, and controlled by the federal government counts as “property” even if the whole state itself is no longer a “territory”. But, like I said, I don’t know much about this. I’ve pointed out to people that some states (like Nevada) have turned over administration of their public lands to the federal government, so the Bundys’ argument should be with them and not the BLM. I’m not sure if this is the case in Oregon, and if not, what constitutes “federal territory.” At any rate, I’m sure the Bundys will bring this up at their trial. “Probity” and “Feinstein” are a long way from synonymous. Really, if you’re looking for somebody to make an authoritative statement about the Clinton matter (among dozens of others), she’s way, way down the list. The giraffe is cool. He should be the center of a cult of — other giraffes! It’d be something to see a giraffe supplicate. Wait, you mean the media has stereotyped people in a manner that, in no way, reflects accurately upon them? The Ghost Of Robert Frost Laments . . .
Whose pols these are I think I know. Instead of at their silly show. To see the woods fill up with CRAP. With empty vows that they won’t keep. A long, damn week til I can sleep.